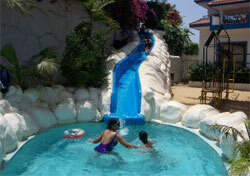 Royal Resorts Haathi Mahal, The Finest Resort Hotel in South Goa. The latest jewel to be added to the Royal Resort crown is the marvelous Haathi Mahal. It is the fifth resort hotel development on the beautiful coast of Goa - where Royal has its roots and where "Royal Goan Beach Club" is a synonym for holidaying in luxury. Experience luxury at its best where not only will you find five star facilities, but five star services to care for you. This outstanding hotel and condominium development is indeed a palace with something catering for every taste. Walk into the entry foyer and you immediately get the feeling of luxury. Look over the swimming pool and you get the feeling of excitement. But all of this is only the beginning of an outstanding holiday experience. Royal Haathi Mahal is just 45 minutes from the airport and 25 minutes from the railway station at Margao. It stands proud between the River Sal and the Arabian Sea, which is just a 10-minute walk away. Cavelossim beach is widely regarded as the most beautiful in South Goa. Enjoyed by the finest hotel, the white sand on this palm fringed beach is sure to give you that truly tropical experience. Haathi Mahal Resorts Hotel mission statement is : "To provide a holiday to far exceed guest expectation"
To ensure that your stay with us is a truly memorable one, we present a gastronomical voyage in a relaxed atmosphere with Meal Plans to ensure we offer you not only excellent food and drink, but the flexibility to enjoy it all and superb value too. Casa Lisboa: Choose the air-conditioning of indoors or eat 'al fresco' on the patio at Casa Lisboa. Open for breakfast, lunch and dinner, this is Haathi Mahal at its very best. Casa Lisboa serves both Continental and American breakfasts, concentrating on local fruits and juices. A substantial buffet guarantees to get the day started on the right note. In case you miss breakfast, lunch at Casa Lisboa offers snacks and of course a full range of more substantial dishes. Our à la carte menu offers a wide variety of excellent dishes rooted in authentic Goan & Indian cuisine, and naturally, we have a comprehensive International selection too. However, every night of the week, we offer "Something Special" to further tempt and inspire you. Jamaica Inn: An authentic Cornish Pub aptly called 'Jamaica Inn' offers excellent cheer, a warm host, hearty food and a pool table. Next door to 'Jamaica Inn' is our 'bop 'til you drop' discotheque. This is the venue for many activities including our occasional 'Karaoke' sessions - all in the very best possible spirit. The Splash Bar: It wouldn't be a tropical holiday if you couldn't laze in the pool and enjoy an exotic cocktail at the same time! The Splash Bar serves perfect cocktails throughout the day to keep you cool under the clear blue sky. Every lunchtime we serve a mouth-watering variety of snacks cooked and made fresh to order at the poolside. This casual set up with sun-loungers spread around the pool-deck is just perfect for a relaxing and stress-free day. The Terrace Bar: Situated at first floor level, the Terrace Gardens provide a private retreat in the resort. Spend a few hours to enjoy Peaceful moments in these 'get away from it all' nooks and crannies. The Terrace Bar is a wonderful location for drinks at sundown, and we can arrange the perfect romantic evening with candle-lit dinners to the back drop of gently lit trees and shrubs. The Gardens can also be used for small private functions. Room Service: For snacks and drinks throughout the day, our team are on-hand to deliver to your door. Ideal if you are taking a break from the midday sun, order-down, freshen-up and your selection will be there. If you feel for a quiet intimate dinner in the privacy of your spacious room or even on your balcony then room-service is the answer. Just place an order sit back, relax and enjoy your meal "Chez-vous' or is that 'Chez-view'? Something For Everyone. With a choice of swimming pools surrounded by landscaped gardens and waterfalls, the OASIS health spa, beauty parlour, hairdresser and gymnasium, there is still more on offer to enjoy. Enlightenment the fun way: Broaden your horizons during your holiday as you join our chefs in an Indian and Goan cooking demonstration. Vegetable carving, rangoli, napkin folding and interactive talks on Yoga & Holistic healing therapies. A Library will keep you occupied for as long as you wish while some board games keep the children busy. Entertainment galore: Feel the rhythm of Goa as dancers enthrall you at the Goan fiesta or relax with the soothing Indian melodies at the Indian night. Every evening, our own Disco invites you to dance the night away. These are just some highlights of the packed entertainment program at Haathi Mahal. Enjoyable exercise: Join in Water-polo, beach volleyball, table-tennis and other competitions or maybe hire one of our bicycles to explore the countryside. Just remember in Goa we drive on the left and the right and down the centre often all at the same time! Bazaar: No holiday would be complete without shopping, and Haathi Mahal offers Bazaar. An on site air-conditioned mini-supermarket with an exclusive range of Indian crafts and gifts, combined with the essentials needed for your day to day comfort. Our rooms are large and centrally air conditioned with the added beauty of a ceiling fan. Bed box, separate reading lights and of course a very comfortable bed. The cool marble and tile bathrooms are very modern with bathtubs, wash basin and English style commode. Individual storage geysers provide the necessary hot water, finished with all the traditional trimmings. Room Facilities: Every room is superbly appointed with direct dial telephone, comfortable settee, and remote controlled colour T.V with cable channels. A dressing table with hairdryer is essential and tea & coffee making facilities makes us a home away from home.